In the spring of 2007, ten years after James and I had started the Maya Angelou Public Charter School, our nonprofit was asked to take over the school inside Oak Hill, DC’s long-term youth correctional facility. Oak Hill had a long and troubled history as one of the nation’s most notorious juvenile prisons. But in 2006, Vinny Schiraldi took over the agency in charge of Oak Hill, and he was determined to reform it. At his invitation, we created the Maya Angelou Academy. Dr. Angelou arrived at Oak Hill mid-afternoon on April 29, 2009. She was 81 years old. Many of the students just didn’t believe us when we told them she was coming out to see them—and right up until she arrived, students were telling us she would find a way to cancel. Nobody like Maya Angelou had ever come out to Oak Hill—and they all knew that. Dr. Angelou wasn’t feeling well. She had to be lifted out of her car into a wheelchair. She had an oxygen tank by her side. I remember thinking, for just a moment, that she looked frail and vulnerable. I had never seen her that way—she was always larger than life, imposing, when she was with us. But she was dressed to the nines, wearing a long, black sequin dress, lots of jewelry, and high heels. She wasn’t going to dress down for her children just because they were locked up. Not a chance. We quickly gathered together under a tent—about 100 students, staff from the facility, plenty of security guards, and everyone from the school. We knew we didn’t have much time. 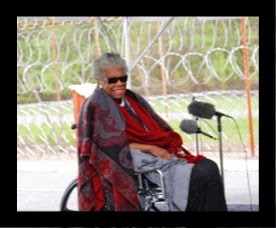 Dr. Angelou sat in her wheelchair on a little stage we had set up. Three students spoke. Darius Watts went first, and gave a brief welcome. He told Dr. Angelou that he was attending a real school, that he had just read Animal Farm, and that his class was studying the Holocaust. She cheered him on. Then Johnny Sorto, a terrific artist, stood up and presented her with a wooden plaque he had made for her in his craftsmanship class. He had chiseled her name, her likeness, and the word “Freedom” into the plaque. As Johnny made the presentation, Dr. Angelou could hear that he spoke English with a slight accent. She asked him where his family was from, and when he replied, she started speaking to him in Spanish right on the spot. There was this collective “ahh” from all of us gathered. She was there with us but also so much beyond us, and we felt that she was taking us with her, over and beyond the fence, for just a few minutes. Dr. Angelou raised her hands to her face, cupped her cheeks, and rocked side to side when Leonte read that fourth line. After Leonte spoke, Dr. Angelou took over. She was brief, her words coming out hard and choppy. I don’t recall too much of what she said, but two things ring in my memory. 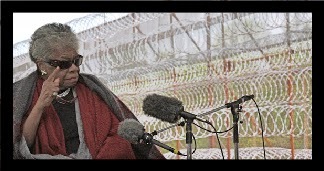 First, she said that she was the “mother of a black man” and the “grandmother of a black man” and that they, too, could have been sitting right there, locked up at Oak Hill. Second, she told the students that if they ever had the chance to come see her perform, all they would need to do is tell the people in charge, “Hey, I’m her nephew,” and they would be let in. Dr. Angelou, thank you for coming to visit your children at Oak Hill. Thank you for letting them know you cared about them, understood them, were with them, and wanted them to be with you. You can read Leonte Butler’s full poem here. To see additional photos from that day, click here. Watch a slideshow of Maya Angelou’s visit here. David Domenici is executive director for CEEAS and co-founder of The Maya Angelou Schools, a network of alternative schools in Washington, DC.